With each passing day, every industry is undergoing a digital transformation in its own way—and eLearning is no different! According to a report by Global Market Insights, the eLearning industry is expected to be worth over $100 billion in the next five years. This is not surprising as employee enablement, onboarding, and engagement become central to the achievement of business goals. A key challenge for those tasked with creating these impactful and engaging eLearning courses is coping with the rapid advancements in technology. The advent of new tools, gadgets, training methods, and cutting-edge equipment is causing a revolution of sorts, taking the industry to a level no one had ever imagined. In 2019, several technological trends could play a major role in eLearning. eLearning course creators must know how to leverage them while offering innovative ways to share knowledge and deliver content. 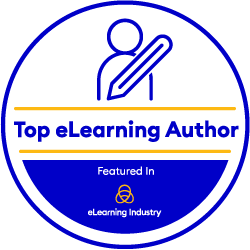 The eLearning industry has for long offered a very centralized approach to providing learning content, where learners had to log in to a particular system to undergo any kind of training. But thanks to the Cloud, this has changed. In 2019, the Cloud is likely to be a trending technology for the industry. Not only can it make content accessible to learners from anywhere, but it also helps overcome bandwidth limitations and ensures content is always available to learners—no matter where they are, what time of the day it is, or what device they are using. The benefits that cloud-based eLearning brings table are multifold—from remote access to automatic updates, periodic data backup to security, personalized and adaptive learning to supporting a wide variety of learning styles—if you’re looking to engage learners in a flexible, collaborative, and cost-effective way, look no further! Analytics is set to become the norm in the eLearning industry in 2019. eLearning professionals will look to analytics to refine courses, improve learning, and deliver business impact. By gathering the data generated by learners while they are taking an eLearning course, you can understand how your users are absorbing the information and which learning aspects appeal the most to them. Based on the learning patterns, you can identify learning interactions that need to be fine-tuned (or scrapped) and improve the eLearning course so learners can accomplish the best possible outcome. Analytics is also a great way to drive personalization—once you understand how learners are taking courses and how they are absorbing content, you can personalize the content that best fits their learning needs and drive more fruitful learning outcomes. Another technology that is could change the eLearning game in 2019 is AR. By super-imposing computer-generated images on a learner’s field of view, AR can make the learning process more interesting and easier to grasp by providing context. Context is on top of the wish list of most learners today. You can offer learners virtual tours that let them feel and experience key aspects of their tasks without them ever leaving their desks (or their home). The great thing about AR is that it can augment existing real-world content through interesting overlays of graphics and images that pop-out and captivate learners. By making the learning process more contextual and experiential, AR makes concepts easier to grasp. Not just that, the overall AR experience itself helps learners connect with the content better. Learners have for long found training boring and rather, pointless. But in 2019, VR could change all that. VR is here to make learning fun and engaging for learners. By leveraging a collection of realistic images and audios, VR eliminates the need to go through pages of boring text and stimulates learners to interact with an environment that replicates the real world. The end result is an extremely engaging learning experience and an exceptional learning impact. Not only can you recreate a learner’s physical presence in a virtual environment, but you can also impart training to learners across the globe. All they need is a VR headset, and in the blink of an eye, they can be transported into an engaging and deeply educational environment. With VR in education predicted to be a $200 million industry by 2020, there is every reason to invest in VR technology and make learning fun and engaging for learners. 2019 could also see AI revolutionize the whole eLearning experience through insight-driven automation. AI can help predict learner behavior, highlight the areas for improvement, and then act to personalize learning based on each learner’s grasping power. AI-enabled bots can assist learners to focus on areas where they are falling behind and guide them along their learning path. For eg., based on collated responses, these bots can decide what question to present next—adding questions when there are too many incorrect responses in a row, or skipping them when there is a certain consistency in the answers. What’s more, learners can also leverage AI to search for key content in modules as well as receive technical assistance whenever required. AI is poised to be that shiny new trend that could transform the learning landscape in 2019 and beyond. Technology could well be the real game changers for the eLearning industry in 2019. It’s clear that the cloud, analytics, AR, VR, and AI will greatly improve learning experiences for all learners. Separately and together, they may redefine the eLearning landscape and could also change the way learners perceive eLearning. The task for eLearning professionals is apparent. If you want to stay relevant in today’s rapidly changing market, it’s important to invest in knowing more about these technologies. That will help you deliver value and drive impact to the courses you create.